Since a long time, apple has always been popular for its medicinal value. A very few fruits have a medicine-like-effect on the diseased condition, but apple is one such fruit with great medicinal and healing properties, as per research, studies and evidences. Apple is an extremely delicious and crunchy fruit with the abundance of dietary fiber, antioxidants and polyphenols. Supplementation of diet with apple has shown to cut down the risk of heart diseases, type 2 diabetes mellitus, high cholesterol and triglyceride levels and cancer. Thus, by adding apple to daily diet, you can actually add a number of vitamin, minerals and other health promoting compounds. The presence of a variety of nutrients in apple makes it an amazing super fruit. Vitamins present in apple include vitamin A, niacin (vitamin B3), pantothenic acid (vitamin B5), pyridoxine (vitamin B6), folic acid (vitamin B9), vitamin C, vitamin E and vitamin K. Besides these vitamins, apple also contains a number of vitamins such as potassium, calcium, iron, magnesium, phosphorus and zinc. On a dry weight basis apple contains 10-15% pectin, which is a soluble dietary fiber present in plant foods. Pectin has a gelling property, that is, in the gut it absorbs water and becomes viscous. Such a property of apple prevents sudden spike in the plasma glucose levels after a meal, reduces the levels of cholesterol, provides satiety, delays hunger pangs, and protects against gut problems. Majority of pectin is present in the peels (skin) of apple. A research studied the dietary fiber composition of 13 different apple cultivars and found that apples are a great source of both soluble as well as insoluble fiber. The dietary fiber content varied between 15 to 20 grams per kilogram of apple. The content of the phenolic compounds is higher in the peels as compared to apple flesh. Each polyphenol provides different health benefits, for example, PHLORIZIN protects against breast cancer, CATECHIN and EPICATECHIN are major compounds that help in lowering the cholesterol level and QUERCETIN may change the activity of thyroid hormones. Certain drugs may damage the lining of the stomach, cause inflammation and reduce the population of healthy bacteria in the gut. Polyphenols present in apple may also play a beneficial role in preventing injury to the lining of the stomach and reduce the inflammation. Apple has emerged to play a vital and beneficial role in the management of type 2 diabetes mellitus. A recent study published in 2014 observed that apple when consumed with oral hypoglycemic agents (medications to lower plasma glucose levels) lowered the symptoms of type 2 diabetes mellitus such as excess thirst, increased appetite and so on. The high antioxidant content of apples scavenges the free radicals that may otherwise play an important role in the etiology of diabetic complications. Scientific evidence has showed that consuming one or more than one apple per day reduced the risk of cancer as compared to consumption of less than one apple. The risk of lung cancer, prostate cancer and colon cancer dropped significantly in individuals who consumed apple daily. The dietary fiber (pectin) present in apples and its peels protects the colon mucous membrane (a tissue that lines the organs of the gut and secretes mucous) from exposure to harmful substances. In the colon, dietary fiber binds these substances and throws them out of the body. In addition to this, the presence of phytochemicals and potent antioxidants in apple fights oxidative stress by neutralizing harmful free radicals that plays a vital role in the etiology of cancer. Vitamin C and beta-carotene are the two powerful antioxidants that are present in huge amounts in apples. Maintaining the total cholesterol and triglyceride levels within normal range is very important for a healthy heart. Eating two whole apples per day has shown to have a positive impact on the overall lipid profile. Apples are an abundant source of dietary fiber and contain no cholesterol and saturated fat. The presence of dietary fiber prevents the absorption of LDL – low-density lipoprotein (unhealthy cholesterol in the body) in the gut. A research found 30% drop in the cholesterol levels in individuals who consumed 2 apples daily as compared to individuals who did not consume apples at all. Another study showed a decrease in the triglyceride levels by 52% in individuals who consumed apple daily. A very positive effect of eating apples daily on the outcomes related to Alzheimer’s disease has been observed by several studies. Such a beneficial effect of eating apples is attributed to the presence of polyphenols in them. Studies have found that besides being a rich source of dietary fiber, apple also contains potassium and flavonoids such as QUERCETIN and PROANTHOCYANIN in abundance (the potassium content of apples may vary with the soil content and other factors). Not just this, but apple also naturally contains low sodium levels (it is very well known that foods rich in sodium raise the blood pressure). It was further observed that certain compounds present in apple and its peels have anti-hypertensive properties and are beneficial in reducing blood pressure in individuals with hypertension. QUERCITIN and PROANTHOCYANIN lower the blood pressure by inhibiting ‘angiotensin converting enzyme’ (an enzyme that raises blood pressure by causing the blood vessels to constrict). High blood pressure, high levels of total and LDL – low-density lipoprotein (unhealthy) cholesterol increase the risk of developing cardiovascular diseases. Consuming apple daily reduces the blood pressure due to its high flavonoid content. Furthermore, pectin present in apple reduces cholesterol reabsorption in the gut and lowers the overall cholesterol level. The presence of different polyphenols in apple provides additional protection to the heart. Scientific evidence has shown that eating whole apple increases the skeletal mass and brown fat (healthy – burns more calories) and reduces obesity and white fat (unhealthy). This is possible due to the presence of certain antioxidants in the peels. However, if the peel is removed, such a positive effect will not take place. Another mechanism through which eating apples promote weight loss is the presence of dietary fiber in it. On digestion, dietary fiber absorbs water and forms a viscous gel in the gut. Formation of such a viscous gel provides a feeling of fullness and reduces hunger pangs. This will reduce the food intake, which will in turn decrease the overall calorie intake and promote weight loss. Thus, individuals who want to lose weight can replace their snack with an apple. Apples and its peels contain dietary fiber and a variety of nutrients. When apple is consumed, dietary fiber swells in the gut and becomes viscous. This provides bulk to the stools and helps in the easy passage of stools without putting much pressure or strain on the system. Therefore, individuals with constipation should consume at least one apple per day without peeling off the skin. Certain storage, cutting and cooking techniques may affect the quality of an apple. Storage plays an important role in maintaining the quality of the fruit. Wrong storage techniques may lead to loss of certain vitamins, minerals, antioxidants and polyphenols. Eating such an apple would provide fewer benefits to the body. When a cut apple is exposed to the air (oxygen) for a long period, the color of the apple flesh may turn brown. Such a color change is due to enzymatic changes that takes place when apple flesh comes in contact with the air. The phenolic compounds present in apple get converted to melanin, which is responsible for the brown color of an apple. Ascorbic acid can inhibit the conversion and prevent browning of apples. Therefore, applying some lemon juice to apple flesh can keep it fresh for a longer period without affecting its color. When apple is cooked, the same browning reaction takes place and some of the antioxidants and heat sensitive nutrients are lost. For example – making stewed apple or poached apple may lead to the loss of vitamin C.
Processing of apples, for example – preparing apple juice, apple milkshake or smoothie may lead to the loss of some important antioxidants. Healthy Individuals: Healthy individuals without any clinical conditions can safely consume 2 apples per day. Cancer Patients: As per scientific observation, cancer patients can get benefits from apples, if they consume 2 to 3 apples per day. Diabetic patients: Diabetics can also safely have 1 to 2 apples per day, but should strictly avoid drinking apple juice. Thus, it can be concluded that individuals may get benefits only if they consume at least 2 whole apples per day. Apple, also known as Malus Domestica, belongs to ROSACEAE (Rose) family and is a POMACEOUS fruit of apple tree. 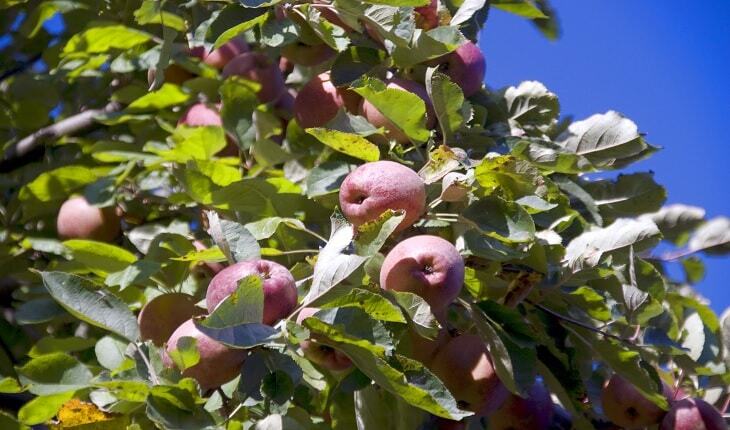 The apple tree is small and deciduous and is approximately 3 to 12 meters tall with dense twiggy crown. It is the most important perennial and long-lived woody fruit crop of the world. It is the fourth most widely cultivated fruit in the world after banana, orange and grape.